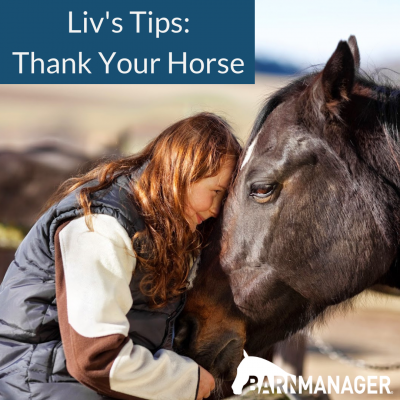 Cultivate a little gratitude for your horse! It’s easy to show daily gratitude for our horses with a treat, a hand graze, extra scratches on the itchy spots. But what about big picture stuff? Like saddle fit? The best diet formulated by an equine nutritionist? Regular bloodwork and soundness exams? And bigger yet? Retirement plans? Finding a barn with bigger fields, larger stalls, more horse friends? Or you could go the opposite way – find gratitude in the little things – like trail rides? Days off? Longer grooming sessions? What’s your favorite way to show your horse some gratitude? Liv Gude, a former International Dressage Groom for years, founded proequinegrooms.com as a way to unite Grooms in the horse industry. The educational website also serves to entertain and inform horse owners across all disciplines about horse care, grooming, and health. Click here to check it out! BarnManager is designed to be a part of your team, with the compatibility and credentials necessary to improve communication, simplify the management of horses, and get you out of the office, off the phone calls, and into the barn with the horses you care about! Click here to get a free demo and find out more! Copyright 2017 Barn Manager. All rights reserved.